Many trading card stores have "common" card sections where you can sift through thousands of cards considered by the store owner to be unremarkable. Usually you can get these cards for next to nothing, and if you look the right way you can come away with some gems. If you are trying to continue a specific collection for a specific team or player, these are the places to go. However, for me I think the most intriguing part of card collecting is searching and anticipating a lucky score. Places like Antique and Collectible stores, especially the ones that are cluttered with collectibles piled onto each other, sometimes have boxes of random cards hidden under tables or being used to prop up some other flashy antique. The easiest way to find this treasure is to just ask the person working if they have baseball cards. If you are lucky enough to find a random box like this, take the time to weed through it. An antique and collectible dealer probably spends most of their energy cleaning off the knick knacks that sell for larger sums of money, which means it's very possible a great card was just tossed in a box for a quarter each. Another place to find some looked over stars is eBay. People sell large boxes of cards on eBay usually for very little compared to how much they are really worth. The key is to recognize who is selling the box. If the seller seems to know a lot about the cards, or if they are selling other sports memorabilia and collectibles on eBay, chances are they have thoroughly looked through the cards before putting them up for sale. What you need to find is the mother selling the cards from the attic without telling her son. A couple of indicators for such a seller include referring to a collection of cards as baseball cards even if there are multiple sports, more description of the storage situation than the cards themselves, and no indication of players or brands. Be aware of how detailed the description of the cards are. If they know the brands, the years, specific cards, and specific players, then chances are they know enough about the cards to either sell them for too much or to ensure no good cards slip through. Once you get to one of these boxes, you need to have several things in mind when searching for cards to pull out. If you are flipping through a box at a card shop or collectible store, you should start a "maybe" pile and a "definitely" pile. The "definitely" pile should consist of cards you are sure you want to take home with you. The "maybe" pile is the important part. You should be very liberal about what cards go in this pile. You should make a list of about 5 things you are paying attention to on each card, and if any of them have one of these factors they should be put in the "maybe" pile. The first thing to search for is names you recognize. Even if you are unsure of why you know the player, and even if you're unsure if the player is good, take it out. When finished searching, you will be able to go through the cards and take a little more time deciding if it's a card to take with you. In the time looking through the cards you may remember how you've heard of the player. Also, there may be some cards later in the box that give you more information. For example, all star cards, team leader cards, or league leader cards can help you find out how you know a player. Always pull these cards. These cards are not necessarily worth a great deal, but they are collectible and cool cards to find. Also, many of these kinds of boxes contain cards from a similar era. If this is an era you are unfamiliar with, these cards will help you find good players from this time. Once you have pulled one of these cards, rack your brain to remember if you saw these players earlier in the box. If you are determined, and can't remember one way or the other, go back through the box. And of course, for the rest of the time pull all cards of players you see on the all star and leader cards. The rookie card is always the most sought after card. 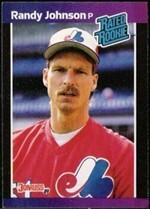 Sometimes rookie cards are obvious because they say so on the front. However, the ones that are more likely to fall into these boxes are the rookies that are not labeled. The best way to determine a rookie card is to simply look at the stats on the back of the card and see when they joined the major leagues. If you turn the card over and you only see minor league teams or a college team, this is most likely a rookie. For baseball, if you even see one year in the majors, it may still be considered a rookie. Chances are you don't really want to search through every card like this, but that is why you have that screening pile. Search through the pile of known players for rookie cards, and of course once you find one it should go in the definite pile. Error cards are harder to spot but should be in the back of your mind. If you see a misspelled word, or any kind of error, you may have a rare card that was looked over and could be worth something. Something that doesn't often get into the random box is the insert card. It's a relatively new thing, so you won't find them in the older boxes. However, they are usually worth a little more than the common card. Look for cards with special names like "Lumber Leaders" or "Heat Seekers", and also check the back of the card for the number. If the number is something like 2 out of 5 or 10 out of 30, then you know it's part of a subset. The main thing about searching through these cards is to enjoy the process. Since these cards are usually inexpensive, and chances are the Mickey Mantle rookie is not hidden in the box, learn to enjoy the small victories. If a card looks cool, and for some reason you were drawn to it, then get it. Obviously you have to weigh the price in there, but really with these kinds of cards you should not be spending any more than a dollar a card. In fact, they really should be about a quarter each or less. So take the time to look through the box and be happy with a few decent pulls.